I was at the cat rehabilitation centre at Emdoneni Lodge, South Africa, when I took this picture. I was allowed inside the enclosure with a keeper. 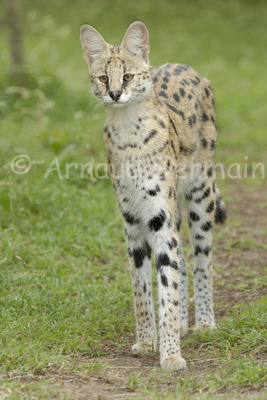 The serval was quite shy so I kneeled down, let her come a bit closer before taking the shot. I wanted to show the long legs of that beautiful cat.